Polish haul & swatches! | S J M W E L L - Fashion, Beauty & Lifestyle blog. The other day I went through one of my "I really love nail polish & want to buy every lovely one in sight" moment's, and this is what the result was. It's really un-like me though, i'm more of a 'save money' girl not spend it all, so yeah i'm not "treating myself" to anything else for a little while. After having my nail's painted in Let me entertain you I've been on the hunt for a match to it, which is why most of these are pink's, Meep Meep Meep is beautiful and much nicer in person then what online swatches looked like, if you want to see what it look's like on my nail's, I have a notd with it on which i'll post soon. Meep Meep Meep has thicker pieces of glitter that don't really 'catch the light' but are still noticable, Be a dahlia won't you is very glittery compared to what it look's like here, the glitter is mixed in the polish (it doesn't "sit" on top of the nail like a chunky glitter e.g juicy jules below.) and it just look's amazing when you turn in the light, it's very lovely- it would be perfect if it was a tiny bit dark but I still love it. I also ordered Model's Own's new Beetlejuice nail polishes, and they wasn't as preety as they looked online, but they're still nice. I had Juicy Jules on my nail's the other week, it's lovely and a close second to my favourite opi d.s radiance. I'm in love with the skin quencher's, I recently reviewed them here if you fancied a read. P.s- yes i know i have two of 'Be a dahlia won't you' it's so so preety, I wish i'd picked up 2 of meep meep meep. Wow the Model's Own Beetle Juice Nail Polishes look fab...I have to try them!! Wonder if there instore in Ireland! 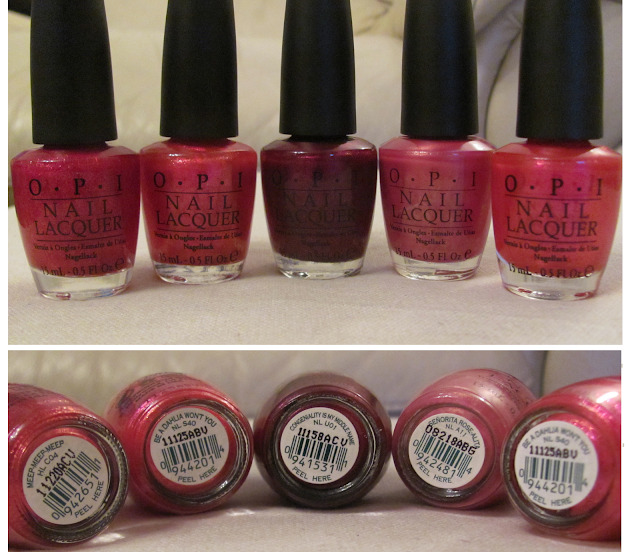 Really want to try OPI nail varnishes!